Mobile messaging service LINE updated its iOS app today with additional language support and an in-app browser, as well as a bunch of new themes for users to dig into. German, Italian and Portuguese are now available for the first time, extending LINE’s reach to some significant new regions in Europe. Given LINE’s consistent growth across Asia – it’s now aiming for 20 million users in Taiwan alone before the end of 2013 – it’s not surprising to see the company’s attention move to Western markets. 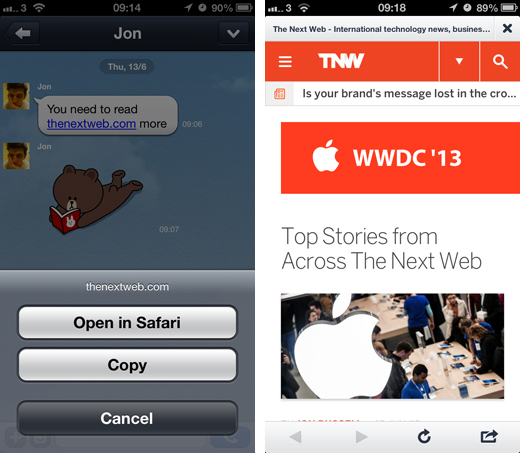 An in-app browser is another small, but notable change. In previous versions, tapping on a link would trigger a dialog box offering only two options – either copying the link itself to the clipboard, or opening the webpage in Safari. For anyone that uses third-party browsers such as Chrome or Opera, it was a bit of a pain. The updated version now displays a rather impressive in-app browser, with only the slightest screen space given over to the title of the webpage and various controls such as refresh, share, go backwards and forwards. Alternative mobile messaging apps such as Kakao Talk and Cubie have differentiated themselves by offering users a number of brightly colored themes to spice up the overall experience. 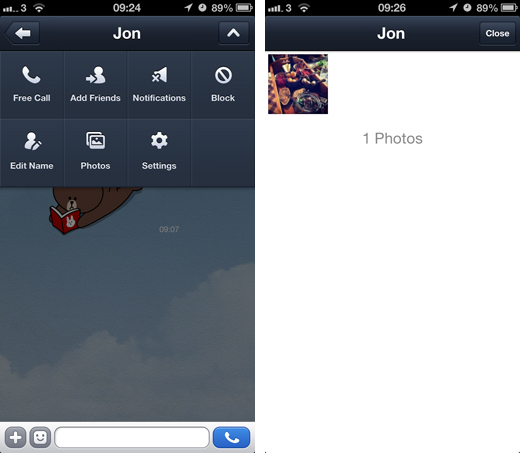 LINE is jumping into this space too and has added a new ‘Themes’ section under the ‘Settings’ menu. 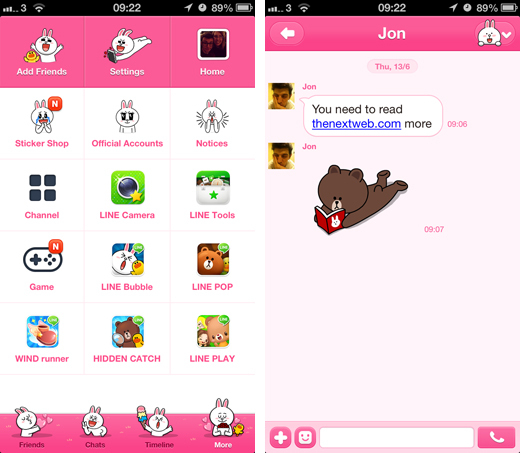 There’s only two options for now – the default theme and a pink alternative featuring Cony, one of LINE’s popular mascots. It’s a little limited for now, but LINE has promised that more themes will be coming soon. The chat room menu, located in the top right-hand corner of the screen, has also been updated with a new ‘Photos’ button which enables users to see all of the images they’ve sent or received in the chat room. It’s a neat way of tracking what’s already been sent, and also downloading any images that are missing from the stock Photos app on iOS. Elsewhere, a new Home function has been added for Official Accounts, which would be great if there were any profiles to look at in the United Kingdom. Users can also choose to display users’ LINE account QR codes on their profile pages, and receive alerts whenever a message has failed to send. The updated LINE app is available right now in the App Store.